With more legitimacy coming to the blockchain space, 2018 was a pivotal year. Here’s an overview of blockchain trends for the period. While 2017 was the year of the initial coin offering (ICO), 2018 saw the rise of institutional investors in the blockchain and cryptocurrency spaces, and legitimacy began to unfold even in the midst of challenging roadblocks along the way. Historically known as the technology behind cryptocurrencies, over the last couple of years blockchain has emerged as a revolutionary force of the 21st century with its impact on other industries. There is a long way to go before blockchain’s impact in other areas is truly felt, but 2018 saw the foundations being laid for a disruptive future. 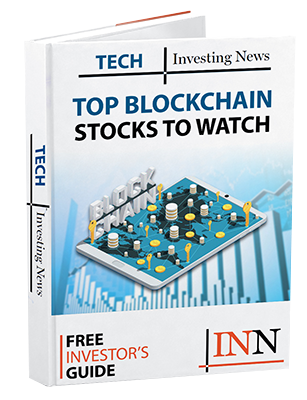 With that in mind, here the Investing News Network (INN) takes a look back at some of the biggest blockchain trends of 2018 with insight from analysts and companies in the space. As was the case for bitcoin in 2018, regulations were at the forefront of blockchain’s year. Kevin Hobbs, CEO of the Vanbex Group, told INN that is positive. Aside from the US, governments around the world have also been working to regulate the technology, with China being at the top of the list. While the country has largely banned cryptocurrencies, it is a leader in terms of backing blockchain technology. “China has made blockchain their thing,” Ervin told INN, adding that there are almost three times as many blockchain-related patents filed in China than anywhere else in the world. “Blockchain technology [will] serve the real economy, focusing on the balance between innovation, regulation and security, and clarifying the bottom line of financial stability and information security,” the publication reads. In speaking with INN, Hobbs said that companies in China are “building some really great things,” and that they have support from the country’s government despite its stance on cryptocurrencies. Meanwhile, the Group of 20’s (G20) meetings over the course of the year heavily featured both cryptocurrencies and blockchain, which Frank Holmes, CEO of US Global Investors (NASDAQ:GROW), says posed challenges in the industry. Holmes said the G20’s decision to postpone its regulation standards “slowed down” the industry’s growth. “[The G20] is dong everything to try and slow it down,” he said. While the G20’s meeting in July focused on anti-money laundering standards for cryptocurrencies, in November and early December the group met to ask for standards on how to more broadly regulate technologies like blockchain and cryptocurrencies. Similar to bitcoin, the movement of institutional investors into the blockchain space has given the sector more legitimacy. “[2018 was] the year of institutional investment into the ICO space — big time,” Ervin told INN. Ervin explained that 2018 saw a smaller set of ICO deals, but said that the amount raised was larger and went primarily to institutional investors. Some significant ICOs in 2018 include Telegram, which raised US$1.7 billion earlier in the year. Bloomberg reported in October that hedge funds have overtaken “high-net-worth individuals” as top buyers of digital coins worth more than US$100,000 through private transactions. The publication notes that miners, which create digital coins through transaction confirmations, have started scheduling regular coin sales rather than offloading in market rallies. “What that’s showing you is the professionalization that’s happening across the board in this space,” Bobby Cho, global head of trading at Cumberland, told the news outlet. In total, over US$7.5 billion was raised in 2018 across 1,247 ICOs throughout the year, as per ICO data. While blockchain’s impact in the financial industry is already being felt, there are other sectors this new technology has begun disrupting. The healthcare industry is one area that has started the process of implementing blockchain. According to a Global Blockchain Technology in Healthcare Market report, blockchain in healthcare will see increased demand thanks to medical data breaches, the rise of counterfeit drugs and medicines and growing investment in startups associated with healthcare blockchain technology. Supply chain management is another area where blockchain’s impact has had a ripple effect. Tech giant IBM (NYSE:IBM) is, of course, spearheading the movement with its various platforms, including the IBM Blockchain Platform. The IBM Blockchain Platform is a fully integrated, enterprise-ready blockchain platform that can accelerate the development, governance and operation of multi-institution business networks. Similarly, IBM’s TradeLens initiative, which was jointly developed with AP Moller-Maersk, is designed to target the global supply chain management industry with blockchain. The platform aims to provide secure real-time data tracking in supply chain shipments. Another industry where blockchain could play an imperative role is food traceability. Case in point: Walmart (NYSE:WMT) announced a partnership with IBM in September; it came in part as a result of an E. coli breakout first found in Arizona earlier last year. The company said it will require suppliers of “fresh, leafy greens” to track their products all the way back to their original locations using blockchain. Walmart said its suppliers should have the appropriate systems in place by September 2019 using a digital ledger created by IBM. While the blockchain industry may have had a tumultuous year overall, the rise of institutional investors in the space and its impact in other industries is certainly reassuring for investors moving forward. 2019 will begin to see the adoption of blockchain in more sectors, while regulatory bodies will continue providing more clarity on how to regulate the industry. In short, the blockchain sector is still in its infancy with plenty of room to flourish, making it an exciting industry for investors interested in the space.